So Christmas came late this year at the Country Boy household. If you’ve read a few of my other posts you’ll remember that we’ve been anxiously awaiting the arrival of a new resident of the freezer. Due to the rather off weather this year and a whole host of other factors, our piggy had a little trouble putting on the poundage to get up to slaughtering weight. Probably the only living animal in the whole county having issues putting ON weight. Real animals don’t grow with factory like consistency and that might be why they are so damn tasty. So we got a couple extra weeks to finish cleaning out the freezers and to get ready for the pile of pork that was incoming. Finally, the awaited day came and we picked up our pig, all freshly frozen solid, and conveniently wrapped in butcher paper, divided into useable sized pieces. All 161 pounds of commercial meat cuts not including the whole head (which is coming later), several large slabs of fat to be rendered into lard later and the organ meat. Due to the way our particular pig was raised, although truly pastured but still fed out on commercial feed we chose to skip the organ meat this go round. That will be an adventure for next time. 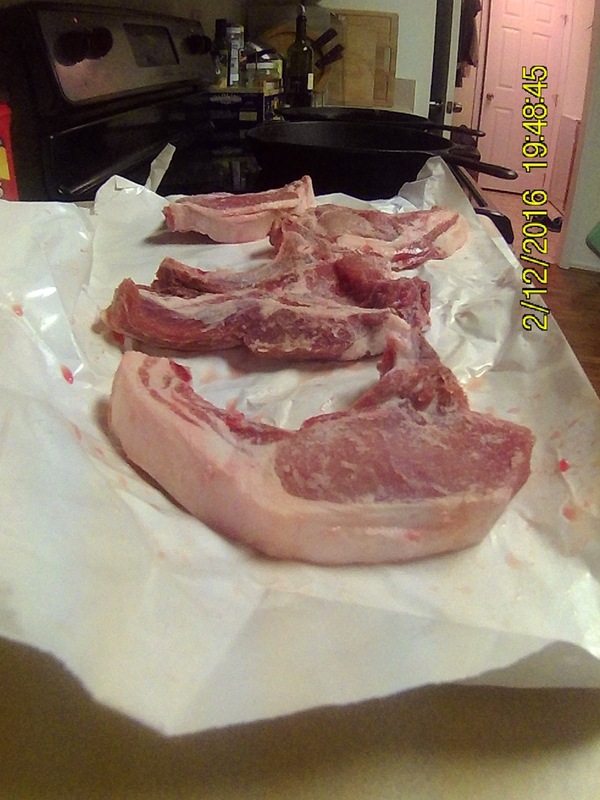 However, our pig weighed 215 pounds on the rail and yielded around 175-180 pounds of usable pork cuts. That’s a pretty efficient use of an animal. Roughly 84% of total body weight will be usable. If we would have gotten a little more creative and included the feet and organ meat that number could have probably gotten real close to 90%. At this stage in the game, I can live with 16% food waste. However, with a little more creativity we can get that number lower. Which brings me to the past. Hog killing is about as old as domesticated pigs, probably a little older. Mostly though, people in the US instantly have visions of Appalachian mountain people when they hear the term. Shelby Lee Adam’s magnificent portrait (link here) did little to change that thought. (If you have never seen Shelby Lee Adam’s work, take a second and google him.) Hog killing was simply a part of life for previous generations, not just in the rural south but all over the world. In my particular corner of the world, I’m only a few steps from the history. Up until recently not many rural southerners considered themselves pig farmers, but a large majority had pigs most of the year. It was normal, like say, having a Twitter account is now. Unlike Twitter, it was a way for people to raise low-cost meat for the family and maybe raise a little extra cash. As bonus pigs are fantastic garbage disposals and unlike Twitter one was privileged to enjoy the delicious spoils of their misspent hours. My one of my great Uncles who owned the land that abuts mine, was the last person I know of to give up the practice, sometime in the early 1990’s. He had switched to using commercial processing houses many years before. So the last hog killing in my little valley here probably dates to the mid-1950’s. Not that long ago, considering most of the food world had been taken over by Betty Crocker well before that. Going back far enough every little Gentile geographic speck on the map probably had its own superstitions and intricacies that went into a hog killing. My great grandfather Grady would wait for the coldest day in November to do it. Probably so that he didn’t have to feed them through the winter and so that the cold would afford a little more time to process the meat. In his time salt curing was how meat was preserved. Smoking doesn’t seem to have been much a thing for family farms around here. So Grady would take much larger cuts than we are used to seeing today and work them in a salt barrel. Sugar curing was unheard of. It was way too expensive if it was available which it probably wasn’t because there was no sugar industry at that point in history. 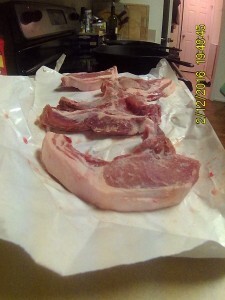 Once all the big cuts were salted and ready to hang, the scrap cuts would be ground to be made into canned sausage, the lite’s (heart and lung) would be cooked and eaten that night, if the chitlins were going to be used the process of soaking them for 9 days would be started and any fat trimmings would be rendered into lard. Possibly the skin could have been fried into cracklings and some bones might have starting being boiled for pork broth while the head was being boiled to make press meat. Today our process was much easier. Our farm, The Falls Farm took the pig to the processor and then picked it up a week later. We met them at the farm and collected our pig, as mentioned, frozen and wrapped in butchers’ paper. All we had to do was transfer the frozen pig to the freezer and we were done. 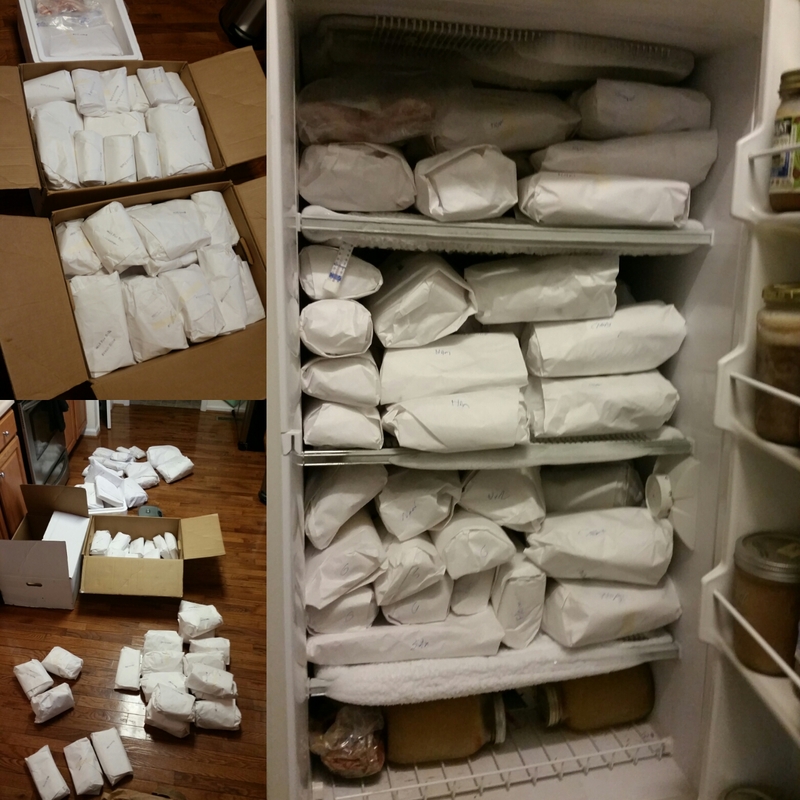 Well, except for coming up with enough different pork recipes to eat our way through 180 pounds of meat that now resides in the freezer. With that, you the reader will be the beneficiary of some rather creative and not so creative adventures in Porcine cookery.